The temperature might continue to drop but we are lit here at BodyJewelry.com with some very serious flaire for this woman lately… you may know her as Inked Amilia on Instagram, Facebook and Twitter but her fans know her by her unique combination of tattoos and piercings that graze her tan, intense yet feminine aura. 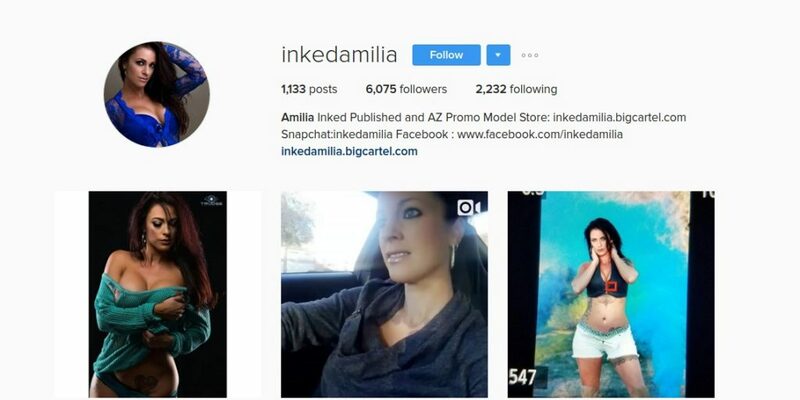 We can’t get enough of Inked Amilia – we invite you to join us in our interview with model, influencer, public figure and brand ambassador, simply put, a woman on fire. Where do you live? What do you love most about the piercing/tattoo community where you live? I live in Phoenix, AZ Here in AZ we are so diverse. We have cowboys, we have bikers, we have corporate bigwigs, We have alternative artists and so many more. Here in AZ tattoos and piercings are a way we show our individuality and its appreciated here. I know many professionals that have nose piercings and tattoos. What do you do for a living or are you a student? If you are a student, what are you studying? I have in my right ear; 3 Lobe piercings and one cartilage and in my left ear I have 2 lobe and 1 cartilage and my belly button (more to come though). Do you have any other body modifications, such as tattoos or dermals? When did you get your first piercing? Body piercing was done in Utah when I was 18. Why did you get your piercings? I got my piercings cause I like to be different. Which piercing is your favorite and why? Do you have a favorite pierced celebrity/model/actress that inspires/influences your piercing and body jewelry choice? Not really, I kinda do what I like and what I feel. I don’t really want to be anyone but myself. Do you have a favorite piece of body jewelry? 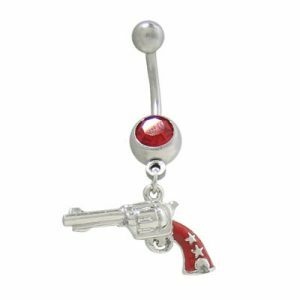 I love my rhinestone gun belly ring. What was your experience with your piercings when you were actually getting pierced? At first you get a little nervous, but then it turns to excitement. Would you say it was painful or not at all or somewhere in between? Of course it was painful, but pain is mind over matter! If you think of something else and how happy you are after doing it, it makes it all worth it. Are you looking to get more piercings or are you about maxed out? Oh no, I have others I want to do for sure, but its hard for me to decide between piercings and tattoos. 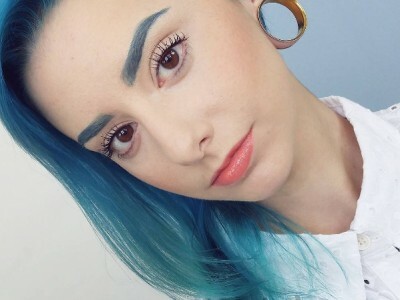 Do you have a piercing you regret getting? If so, why? Absolutely not, regret is for the weak. 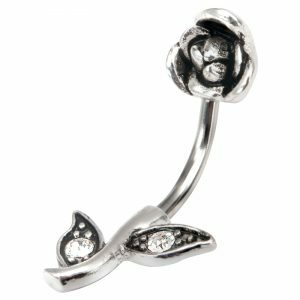 What is your favorite body jewelry for you piercings? For instance, do you prefer simple, steel barbells or elaborate dangling body jewelry and why? I love the dangling jewelry, I am not super girly, however I love to decorate and accessorize my body and outfits. How does having your piercings make you feel? Does it help you stand out, make a statement, make you feel more unique, etc? Not really, It really makes me feel more like myself. I don’t really care what others are doing or notice. I like to just feel more like myself. And piercings and tattoos do that for me. 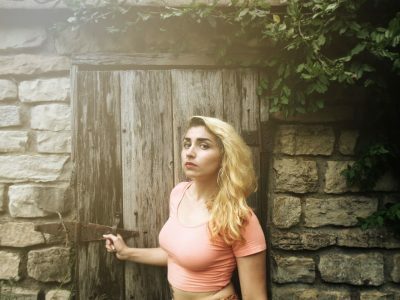 Does your employer or school restrict you in any way with your piercings or body art, or are they supportive? Well, I would say yes. I have to hide my tattoos and cant get super extravagant piercings. Because of the perception that people with ink and tattoos cant be professional, it makes it hard sometimes to convince a multi millionaire that even though I have piercings and tattoos that I am just as smart as I would be without them. If you could give one vital piece of advice to someone who is new to piercings, what would it be? DO IT A VERY WELL KNOWN PROFESSIONAL with a good history and reputation. Sometimes because it cost more is because you are getting done with clean sterilized professional good quality needles. Body modifications are not for the cheap. You get what you pay for. Inspired by Inked Amilia? Get it here!